- Equipped with the quick release mechanism. We are devotedly engaged in manufacturing a wide range of excellent quality Wood Working Vice for our valuable clients. Wood Working Vice Heavy Duty 8"
Seasoned cast iron body, spindle chrome placed. We are among the celebrated names in the industry, offering WOODWORKING VICE to our valuable customers. These vices are made available with hardened and knurled jaws and are extensively utilized for metalworking applications. These vices clamp the work pieces while work is being done on them. 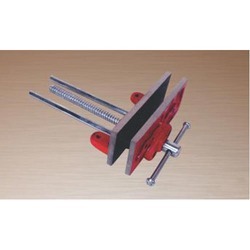 Woodworking vises are attached to a workbench, typically flush with its work surface. 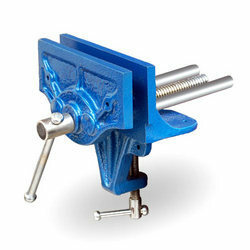 Designed with generous jaw area which gives even clamping on the whole depth of the workpiece. Our Wood Working Vice are made from high quality Cast Iron, Screw made from steel with bright handle, in the latter case they are usually faced with wood to avoid marring the work piece. The top edges of the jaws are typically brought flush with the bench top by the extension of the wooden face above the top of the iron moveable jaw. This jaw include a dog hole to hold a bench dog. We are Leading Importer and supplier of Wood Working in Chennai. Our Magnetic These are available in various designs, models, sizes and competitive price to our customers. - Size range : 175, 200.225 mm.